The swinging '60s saw the rise of rebellious teens, with pop music at the heart of their culture; a time when Cliff Richard, Roy Orbison and the like were the idols on every bedroom wall. 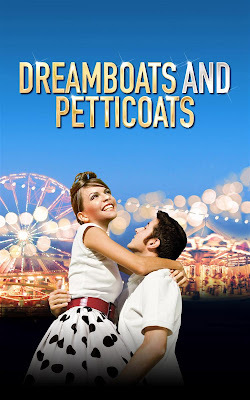 Dreamboats and Petticoats is a celebration of '60s teen culture, even if it all seems rather quaint and innocent by today's standards. The show immediately takes us back to '60s England, with its graphic collage set that pops from the stage, via a modern day framework that is underused and unnecessary. What follows is the tale of a group of teens at a local youth club as they fickly fall in and out of love, compete in a songwriting competition and debate the supremacy of various rock and roll performers. For all intents and purposes, this is the British equivalent to Grease. This is a jukebox musical, consisting of numerous songs from the era, which certainly allows the (mostly older) audience to relive their youth by singing along with glee. The songs are performed by the on-stage band who double up as characters in the story, putting music at the heart of the narrative. Of course, the best tunes are saved for the second act, the story suffering a little as it's used to merely set up the next song, but even younger audiences will recognise the catchy melodies and simple four chord progressions. The music is supplemented by some excellent singing and colourful characterisation. Louise Olley shines as the flirtatious tart Sue, packing a sultry punch with a powerful set of lungs; Matthew Colthart's Elvis-wannabe Norman certainly knows how to woo the ladies; Hannah Boyce plays a suitably squeaky sweet-sixteen Laura; and Stephen Rolley croons in a pure, boyish baritone as Bobby. The choreography, too, is sprightly, with the cast bounding around the stage with lively gusto. As is typical, the finale is a medley of hits, though here it's predominantly a showcase for '60s star Mark Wynter (playing Bobby's father). A greater emphasis on the talented young cast would have been more fitting. Yes, the story is clichéd, stereotypical, whimsical fun, but it's not without its charms. When performed by such a vibrant young cast, you cannot fail to be thoroughly entertained. Watch: Dreamboats and Petticoats is currently touring across the country, details here.